Preliminany Analyses on Economic Benefit of Management Techniques for Masson Pine Plantation in Guizhou. 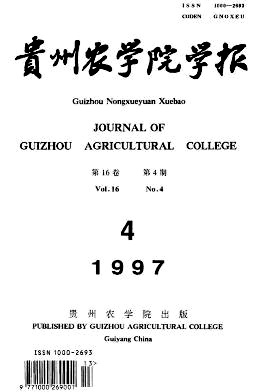 Qi Xinmin; Wen Zuowu; Xie Shuanxi; et al. Study on the Growth and Developent Traits Sucking Meat- Purpose Rabbits among Five Breeds. Cheng Yuan; Xiao Chaoneng; Zhu Xiaotong el al. The Epidemic Pattern and Preventive Method of Tobacco Brown Point Disease. Sun Guangiun; Su Mingyan; Liu Chengyi et al. The Inferior Determination of Eleven Kinds of Beverage on Guiyang Market. Thou Kaizhi; Ye Zairong; Chen Weilan; et al.